Whiskytown Lake. The lake is Redlands emergency water supply so it was completely full of clear blue water. Along the shores were lots of nice sandy beaches. Not too many people on the lake, but the water sure looked inviting. It was starting to get really hot. In fact when I stopped in Redlands for gas, it was 98 degrees and it was only 10:30 am. I gassed up and called home. I also talked to a couple on a Harley who were from Sacramento on their way to Canada. We talked a little about our trips and headed on our way. 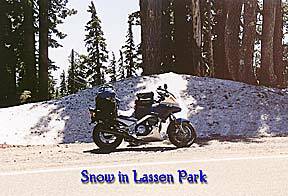 I was going to one of my favorite places - Lake Almanor - and on the way was Lassen National Volcanic Park. The road from Redding to the park, Highway 44, is very nice. The scenery changes from dry brush to oak savannas to forest as the road gains altitude. As I neared to Lassen Park, I passed several folks on their bikes. Some turned south on Highway 89 and headed for the park, others continued up highway 44 towards who knows where. 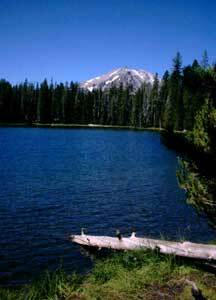 Lassen Park is one of the most beautiful parks in California. If you haven't been there, I strongly suggest that you go. Beautiful lakes and streams abound. I was surprised to pass a small lake created by a beaver's dam. An amazing piece of engineering. I continued up the road checking out the campsites around Manzanita Lake. A beautiful lake, but I didn't see any campsites right on the lake. That's probably why the lake is so nice. Onward and upward to the summit, one of my favorite stopping spots. 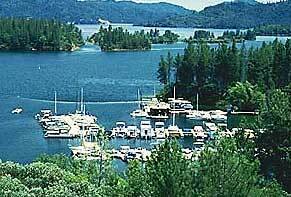 Summit Lake is about a 4 acre lake - not much more than 10 to 15 feed deep but surrounded by trees and grass "beaches". It was more crowded this year compared to last, but it was still possible to find a nice grassy place to sit by the lake and just take in the view and relax. It was getting a little warm so I thought that a swim would be in order. The water was fabulous. Clean and clear. I stayed at the lake for a couple of hours, had a snack and a beer I had been carrying. I was getting low on water so I decided to refill my bottles. 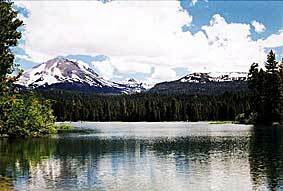 The water here in Lassen Park is the best! better than any other place I'd been on this trip so far. So, after repacking the FJ, It was time to head over the mountain and on through the park to Lake Almanor. As I got higher up the road, the scenery started to change. With altitude, the trees thinned out to almost nothing leaving the amazing rock formations exposed. Up near the summit of the road, there's a place that if you look south you can see Lake Almanor. On a really clear day, I've been told you can see Lake Almanor and Lake Tahoe. Also, snow is a big thing here. Last year there was tons of snow along the road, but this year there's nothing. Not even on the highest peaks. A testimony to the mild winter the northern latitudes had last year. Over the pass and down the other side - past Lassen Peak and the amazing volcanic areas with bubbling mud pots and sulphur springs with steam spewing out of the sides of the mountains with a strong sulphur smell. I rode to the visitor center and picked up a new shot glass for my collection then proceeded out of the park and down towards Lake Almanor. After dinner we headed back to her place for some good conversation - a chance to catch up on each other's lives - a walk along the very low Lake Almanor and some really good pot. She gave me a little gift to help me with the remainder of my travels. Thank you very much! I set up a place to sleep outside and went into the house to spend some time with Sarah's other friends that had stopped by. One of her friends had been studying the American Indians of the southwest and their methods of storytelling and passing on their histories. Very interesting indeed! After hearing some stories, a little TV it was off to bed for some well deserved sleep!